In my last post I described how four Apache helicopters had appeared out of nowhere, coming from the direction of France and flying right over our heads to disappear inland. It was an incredible sight. As they disappeared, we squinted into the distance, trying to see where they had come from. The heat haze on the horizon held an almost mirage-like quality to it. The shimmering shadows were little more than watery specs, rippling in and out of visibility on its far reaches. What were they? Then something else grabbed my attention, just to the right. A huge, barely visible hulk seemed to be emerging from the haze. A ghost ship. It dwarfed the others. The fact that it could only just be seen added to its silent size and might. If you look closely in the photo above you can just make it out. Did you miss it first time? Can you see it now? 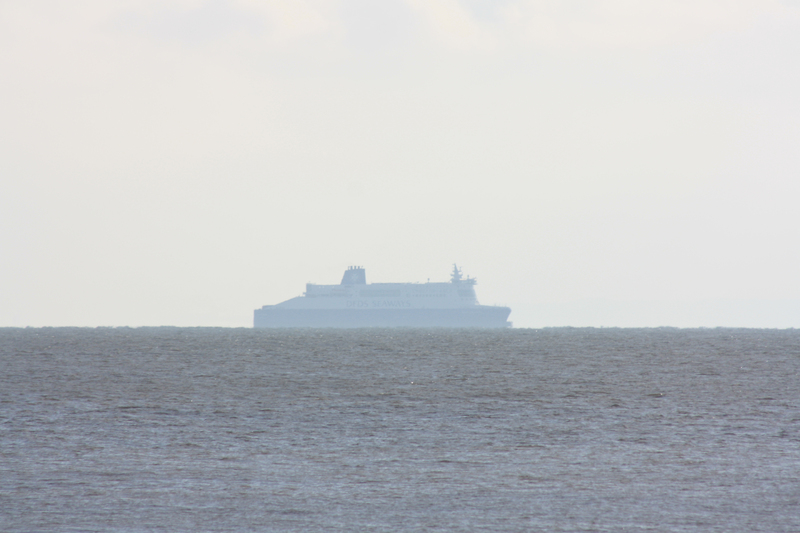 In fact, this was the first of an enormous and continuous procession of ships heading into Dover. We were still about five miles away from Dover, yet from this point on ferry after ferry emerged from the horizon and slowly made their way to the harbour. 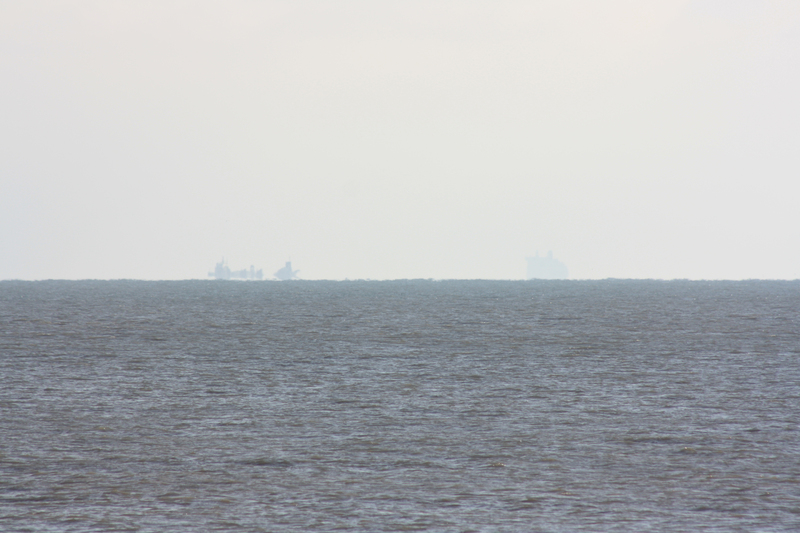 Container ships criss-crossed the ferries as they moved up the Channel, and we began to understand why the English Channel is the busiest shipping lane in the world. As we walked, the ghost ship became clearer, and then turned east to head into port. It was the first of many ferries we would see today. 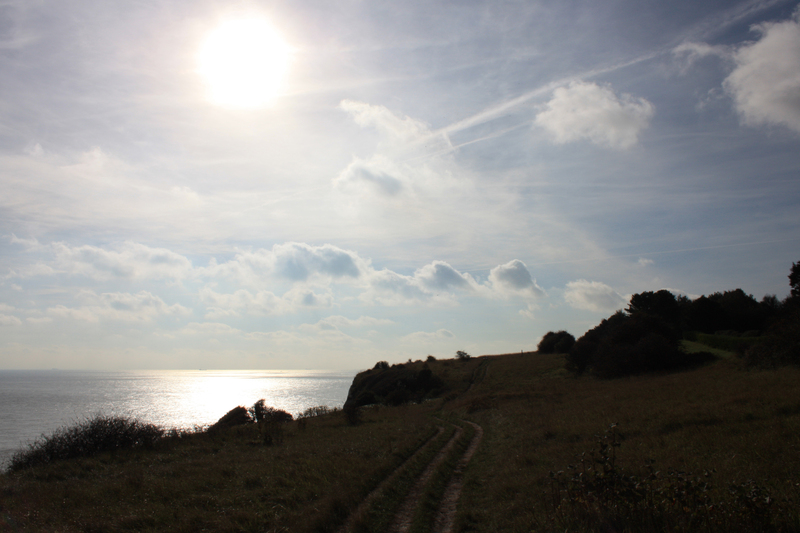 As for us, we carried on south, and at last reached Kingsdown and the start of the cliffs. The cliffs did not disappoint. We saw very few people. 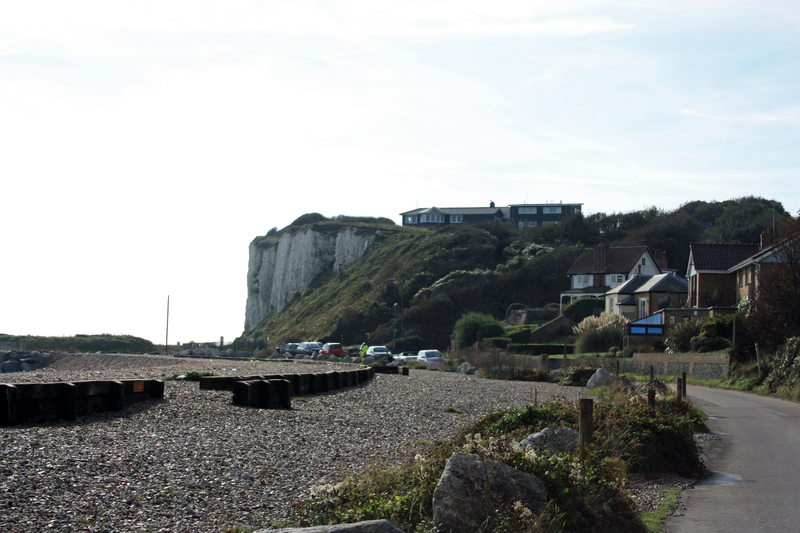 The path ran alongside the cliff edge, inland by about 30 feet, giving us sweeping views across the Channel and the ever-ceasing churn of shipping into Dover. The sun twinkled at us, the water reflecting its rays from below. After the monotony of the path leading out of Deal and down to Kingsdown this was a real treat, spoiled only by my wife’s squeals of alarm as she warned our children not to go too close to the cliff edge and whipped herself up into a frenzy of health and safetiness. Being somewhat allergic to these occasions, I walked away from the noise, but that meant going closer to the edge of the cliff. I discovered that the volume of my wife’s remonstrations seemed to correlate almost exactly with the distance I was from the cliff edge. As I got closer to the edge so as to move further away from her scolding, she shrieked more loudly in direct proportion to the distance I had moved. The result was that wherever I moved, the telling off I got from my wife remained at a constant. After unsuccessfully experimenting with volume control for a while I decided the best thing to do was probably return to the path. 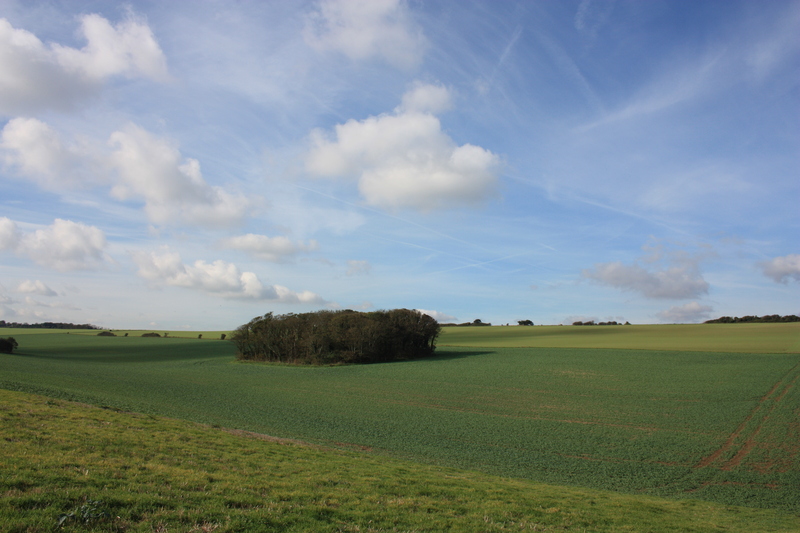 I am glad I did return to the path, for the views inland across the rolling countryside were beautiful. On the horizon the Dover Patrol Memorial came into view, announcing we were close to St Margaret’s at Cliffe. The Dover Patrol had humble beginnings as a poorly equipped unit, yet became one of the most important Royal Naval Commands of the First World War. As well as undertaking anti-submarine patrols and escorting merchant ships, it laid mines, swept German mines, provided hospital ships, and bombarded German positions on the Belgian coast. Its officers included Lieutenant C H Lightroller who had been the Second Officer of the Titanic, and Captain E R G R Evans. This was the Evans who had been with Scott on his ill-fated expedition to the South Pole in 1912. Evans always had a mascot nailed to his mast – a penguin. The vessels of the Dover Patrol saw considerable action. Almost 2,000 men died in its service. 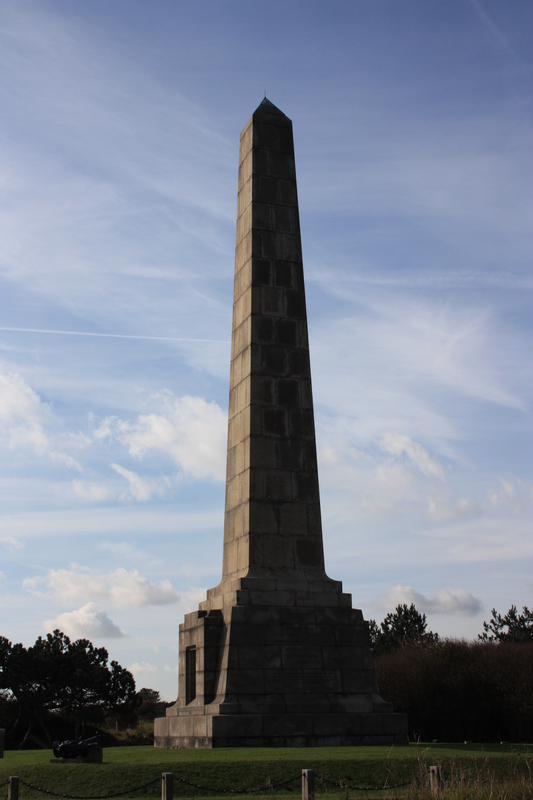 The memorial to these fallen was erected in 1921 and stands at just under 84 feet tall. It was at the memorial that we met our Guest Walkers for today, John and Trisha. We saw them striding down to us from the memorial, John resplendent in his plus-fours! 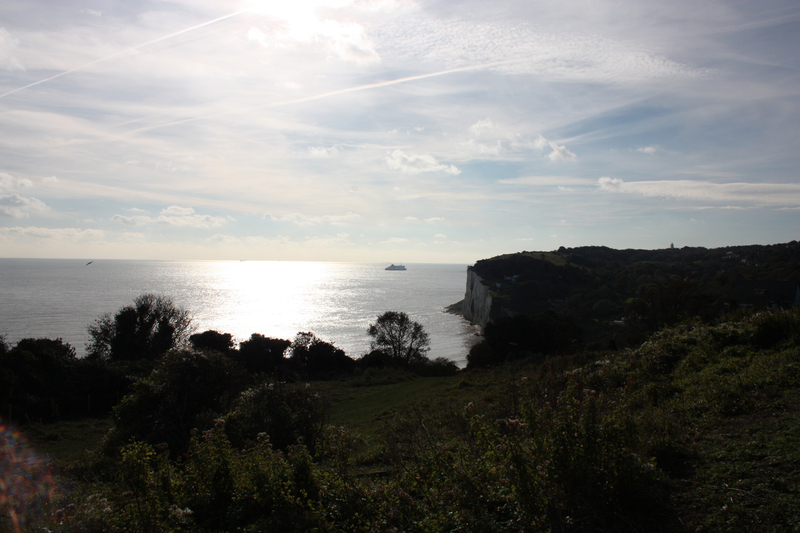 We walked down into St Margaret’s Bay, watching as the ships continued to sail in to Dover. Down in the bay, we stopped at the Coastguard pub and restaurant where I had what I would probably describe as the best fish & chips I have had in a long, long time. And then, back up the cliffs and off to Dover! This entry was posted in Kent and tagged cliffs, coast, Dover Patrol, Kent, Kingsdown, obelisk, St Margaret's at Cliffe, travel, walking. Bookmark the permalink. Ha ha! My reference source doesn’t mention whether they were real or not – perhaps they thought it best not to report the finer details! If we ever came across you and your family on a cliff ~ I’m quite sure I’d get along swimmingly with your wife, while I know both you and my husband would be in stitches (one way or the other)!! Jody, your use of the word “swimmingly” is an interesting choice, given the waves were lapping right up against the base of these cliffs. I think if you and Deb ever do get on swimmingly in this particular location, your husbands would not be in stitches, but tearing down the cliff calling the lifeboat. Thus husbands can be marginally health-and-safety conscious in certain situations!